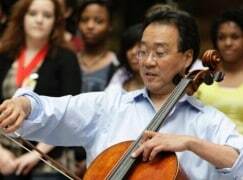 In a homicide capital, a globetrotting cellist plays peacemaker and educator. That ain’t the half of it: the entire dimocrat socialist state is about to default. Illinois, California, and New Jersey are in dire need of a dumocrat party to save them; ain’t gonna happen, though. As far as Yo Yo, he would be better off staying away from crime-ridden Chicago. No amount of feel-goofdness can stand up to the gang violence that plagues that dungeon. Wish Obama would head right over there when he gets back from his world travels (not that he would do anything). Oh stop, Putin troll. Please crawl back under your rock. I go all over the city and have never once been so much as mugged. You truly are disgusting.